Samuel Weaver is a tabloid illustrator and reporter for The Illustrated Police News, whose sensationalist style makes him both popular with the public and hated by the authorities. Obsessed with an infamous murderer, Sibelius Darke, he will let nothing get in the way of finding the truth behind the stories. Meanwhile another set of ghastly murders has begun, linked to Darke’s reign of terror six years earlier. I read this via The Pigeonhole app which made the reading experience even more interesting as you got to share your immediate thoughts daily with other readers and the author himself - and he seemed to enjoy the range of responses - mostly shock and horror! -that Domini Mortum brought out in us all! 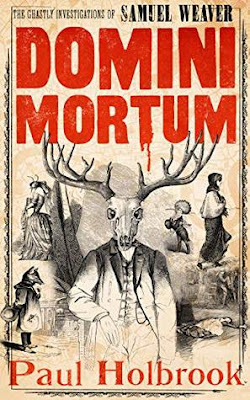 I haven't read Memento Mori - but will be rectifying that as soon as I can! - but I found the darkness of this story so instantly entrancing! There were many times I found myself not knowing where the story was going to lead to, a cast of characters who one minute you're on their side, the next they betray you, and full of darkness in a grizzly murderous kind of way! Sam Weaver is at the centre of the story. His talent is for drawing and he uses it to portray crime scenes for the local press. And the scenes he gets to witness never seem to turn his stomach, although they turned mine as a reader when described in this book! He becomes obsessed by these crimes that all seem to be linked, but is constantly met with people at the top trying to hush things up. He meets some very interesting characters along the way - some help, many hinder his investigations - and you also get to find out more about Sam and his past proving that darkness can be found everywhere!! I loved the ride that this book too me on and the shocking ending has left things nicely poised for more!